During our recent Christmas break, I reviewed the performance of my company’s blog. I also looked at our lead generation efforts. And as it turns out, many of once strong calls to action, lost their effectiveness. For example, our under the post banner, inviting readers to sign up for a newsletter drove hardly any signups, converting at below 1%. The Hello Bar didn’t fare any better. The slide in, a call to action appearing on the side of the screen after a person’s scrolled past 40% of the page, delivered below 2% conversions. Only the exit popup we display once a person decides to leave the site converted at the average rate, ca. 2%. And from what I hear from other website owners, they achieve similar results. So why those CTAs don’t perform any better? One reason could be all the noise that surrounds us online. The other – the relevancy of the message. Let’s tackle the noise first. We get prompted way too many times to take action online, and we begin to tune out to those messages. We already ignore banners and other advertising online. In fact, as some research suggests, only 14% of web visitors remember the last ad they saw and can name the company behind it. And only 2.8% thought the ad was relevant. What’s more, less than 1% of them clicked it. And now, we begin to exhibit the same behavior towards calls to action. …unless the CTA offers something incredibly useful to us. We tune out to calls to action, unless they offer something incredibly useful to us. And the above statement is hugely important to your lead generation efforts. When analyzing our calls to action, I also discovered that a group of CTAs consistently drove double-digit conversions. The same was true for all our clients. And that’s even if they received relatively low traffic. As it turned out, some calls to action started to lose their effectiveness. Others, however, boosted our and our clients’ lead generation. What calls to actions they were? Content upgrades, as the name suggests, are lead magnets that expand the content of a particular post. Unlike eBooks or whitepapers, content upgrade works only with a post it expands. In other words, you can promote them only from one piece of content. And that’s actually a good thing! You see, the strength of content upgrades lies in the fact that they deliver additional value AFTER a person has already got a lot of useful information from you. What’s more, they also promise to offer even more useful stuff. Checklists that guide a person through a process of achieving something. An extended version of the article, typically upgraded with extra tips or resources. List of resources that could help a person overcome a problem or complete a particular task. But What Makes Content Upgrades So Successful as a Lead Magnet? 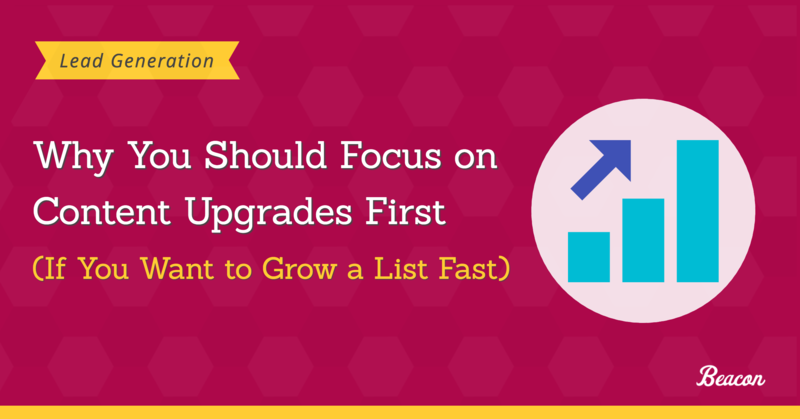 Using content upgrades isn’t just about creating a checklist or any other bonus material. “Content upgrades that yield high conversion rates revolve around four core principles. They fulfill the visitor’s next intent. Content upgrades work because they offer knowledge that sets a person on a path to success. A checklist will help them go through a process, and ensure that they don’t skip any important steps. A resource list offers additional knowledge they may need to reach their goal. It starts with a person landing on a post that seems relevant to their current needs or a problem. They consume the content, and (hopefully) find it relevant and helpful. Next, they notice a call to action promising even more information that could help them. Providing that its headline reassures them of the content upgrade’s value, they sign up. And Do You Want to Know The Best Part…. Content upgrades are also ridiculously simple to create. For the most part, they require very little additional work beyond just writing a blog post. Remember, a content upgrade EXPANDS a particular piece of content. It does it by providing extra information or listing resources a person needs to get started. If you write a how-to tutorial, then to create a checklist, you just need to convert its key points into separate tasks. Providing you’re knowledgeable on the topic of the post, you should already know what resources would help a person complete the task you’re describing. And it works. You can even listen to Kevin, Beacon’s CEO talking about it in this podcast interview. Every lead generation strategy produces some results. But not all of them deliver such a fast growth as content upgrades. And for that reason, you should focus on them first, if you want to grow your list fast. Want to see how you could get started with content upgrades to generate leads? Click here to learn how Beacon could help you create and launch them in minutes. Excellent article! Could I do this with a popular blog post on my site (daydreamexcurions.com)? I have a post that gets good organic traffic everyday; would I drive people away if I did a content upgrade x% through the post? Hi Dave! A good content upgrade should work in partnership with an article. Either of them would work fine on their own but your readers will get most value by combining them. The trick is to make this clear when you are offering the content upgrade. The ‘secret strategy’ content upgrade mentioned in this post is a good example of that technique. People aren’t going to abandon the post just to get the secret strategy but when they finish reading the main post they’ll definitely be curious about what that secret is.